Did you know that lost information at work is estimated to cost the UK economy £15BN every year! That’s why with FIELDFIX smart mobility software, we ensure that the information you store is just as easily accessible, no matter when the data was captured be it yesterday, a month ago or even years ago. We recognise that there is nothing more frustrating than having information buried in your software system that you’re unable to get your hands on. Your staff begins to view it like a “black hole” once information goes in, it never comes out! At FIELDFIX we are passionate about a lot of things. We are very proud that FIELDFIX is fast becoming a Best of Breed mobile information system, recognised for getting the right information, to the right people, from anywhere, anytime. We are also committed to helping businesses work smarter not harder. So, if you are starting your journey in searching for a smart cloud-based software solution, make sure that the information you want to capture can be just as easily accessed. Remember though, gaining information is only a small part of the process, knowing how to store, access and utilise data, is critical to the success or failure of your business. Read more about how FIELDFIX makes sense of information the easy way with practical, no non-sense business reporting. Working Smarter with FIELDFIX and Maestrano! One of the key issues businesses with remote or in-the-field workforce’s face is in capturing information as it happens in the field and getting it back to the office in real time, whatever that information may need to be. Once back at the office however there is often the question of how that information is sorted, reported and then potentially moved on to where it needs to be within the business. One of the unique things about FIELDFIX is that it provides the ability to capture both structured and unstructured information in the field. Having been built with integration in mind it can also easily feed that information as required to the other areas of a business – from Enterprise level financial systems down to simple legacy in-house databases. In partnering with Maestrano we are making this even easier for small to medium businesses by providing out of the box integration with all the Apps in the Maestrano iPaas App family. Now FIELDFIX has the ability to communicate information automatically to these applications, providing the opportunity for businesses to utilise a complete business solution from one place, at a cost that is a fraction of the price of what Enterprise Level software usually costs! With Maestrano rapidly expanding in the North American market, following the trend of the rest of their operations growing faster every day in Europe, the Middle East, Asia and Australasia, the number of Apps FIELDFIX now integrates with out of the box is exciting for businesses with a mobile information capture requirement. FIELDFIX is continuing to help you work smarter, not harder! FIELDFIX is all about working smarter, not harder. We find that once our FIELDFIX customers get a taste for this, they can’t wait to drive FIELDFIX product capabilities to new levels of efficiency and that’s exactly what we love! We are always looking for new innovative features to help our customer stay ahead of the game and we can’t wait to hear the results of our latest customer driven feature Productivity Reporting. FIELDFIX has already proven that it’s a great tool for motivating staff and increasing their productivity. This new feature takes it a step further by encouraging field crew to work more efficiently and gives them the tools they need to report their awesome work to management quickly and effortlessly. Productivity Reporting enables our customers to really stay on top of their business, manage the productivity of staff and jobs from 1000s of miles away with automated daily productivity reports emailed straight to their inbox. We positively encourage our customers to help drive our innovation, so if you have any smart ideas contact us today. We have over 20 years’ experience in software development and understand that our customers are the experts in their business niche. Working together we make a powerful team! With more and more people owning smartphones, taking photos has become very much part of recording our everyday life. Whether posting a picture of your meal on Instagram, a catch up with friends on Facebook, or a memorable moment shared on WhatsApp. It’s no surprise therefore that photographic evidence is now an expected part of our daily business reporting. With most field staff in possession of a smartphone, it shouldn’t be that hard to document photos right? But if you don’t have the software to automatically label, file and merge photos into customer reports in an instant, documenting photos in your business reports can quickly become a laborious task, a far cry from the ease of sending a photo straight to FB! With FIELDFIX you need never worry again about SD cards, lost photos, sharing and downloading images, labelling, filing and manually inserting photos into documents and customer reports, because FIELDFIX does it all for you instantly. At the time of taking a photo with FIELDFIX, you can add a full description, location and much more straight from your smart phone or tablet. You can even take multiple photos of the same event, a sketch or a sketch on a photo. FIELDFIX then automatically names and files all photos and text to the appropriate job or activity you are reporting on. Need a professional report to send to your clients? 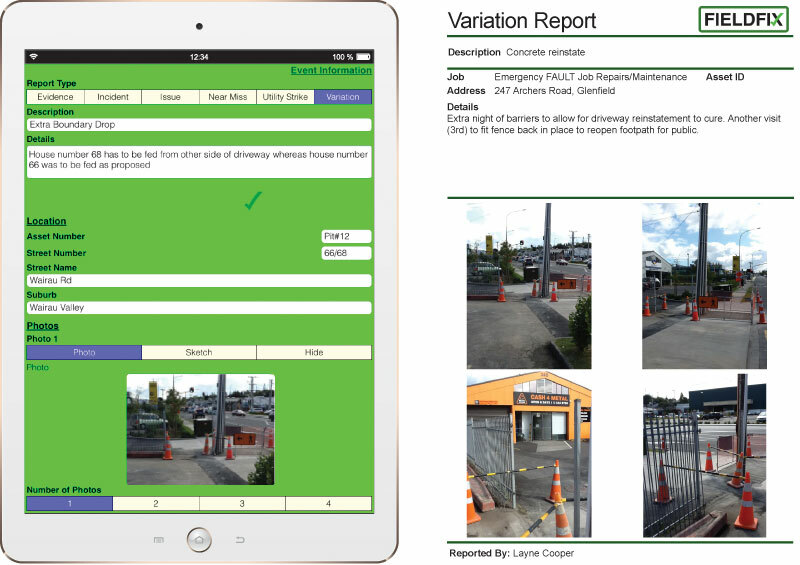 FIELDFIX automatically compiles all photos and text into a neatly presented professional PDF report that you can email from the field in seconds. Moreover, you can automatically schedule event reports to be sent to your Managers’ and Clients’ email inbox as they happen in the field so that any issues can be swiftly addressed. Need to check back on a particular job or incident months, or even years later? FIELDFIX files and stores all job and client information together making your data easy to access and utilise from anywhere, any time. With FIELDFIX you can automatically insert photos, sketches or sketch-on-photos into your business reports. Read more about how FIELDFIX Event Management can help your business to work smarter, not harder. FIELDFIX works in any business, so whatever your need contact us and have a chat about how we can help. More recently, we’ve been attracting attention from all sorts of specialist industries near and far including security, electrical, logistics and transport. It’s really exciting to see how our FIELDFIX job management software is evolving to provide a wide range of businesses with a solution for their data capture and management needs. More and more we’re hearing how we’re really good at getting the right information, to the right people, from anywhere, any time. So if you feel like you are struggling under the burden of paper reporting systems, or finding it hard to capture the information you need from the field and get it back into the business efficiently and instantly, get in touch with the FIELDFIX team. We’d love to hear more about your needs and welcome the opportunity to get you and your team working smarter, not harder. And of course it goes without saying, as is the FIELDFIX approach, we will support you every step of the way! FIELDFIX Event Reporting just keeps getting better. Get reports sent straight to your inbox! We work closely with our customers, listen carefully to their needs and innovate. That’s why we’ve added another smart feature to FIELDFIX Event reporting in our most recent software updates. As suggested by one of our clients, FIELDFIX Event reports can now be scheduled and delivered straight to your email inbox. You no longer need to login to your FIELDFIX dashboard and manually run a regular report. This is just another small efficiency to help you work smarter, not harder. FIELDFIX keeps you in touch with what’s happening in the field and makes it easy to access and utilise the information in real time so that you can make your business a success. Did you know that FIELDFIX does a whole lot more than just job management? Sure its design origins started in job management with the focus on getting data from the field to the office in seconds. Since then, FIELDFIX has evolved into much more than a smart mobile job management system. Every business is different and has its own specific data capture needs. It’s not just about making do with what you’ve got, and at FIELDFIX we understand that. With the introduction of FIELDFIX Custom Forms, our customers are not limited to pre-defined data capture fields. Rather you tell us what information you need to capture, and we will sort it quickly and without the usual high development costs customisation attracts. FIELDFIX Smart software for fat fingers. Enabling all sorts of businesses to get the right information, to the right people, from anywhere, any time.